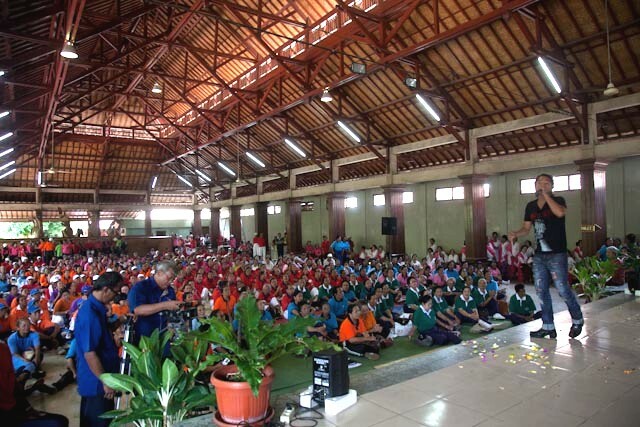 2012 marked the 24th anniversary of Yayasan Wreda Sejahtera (YWS) Bali. 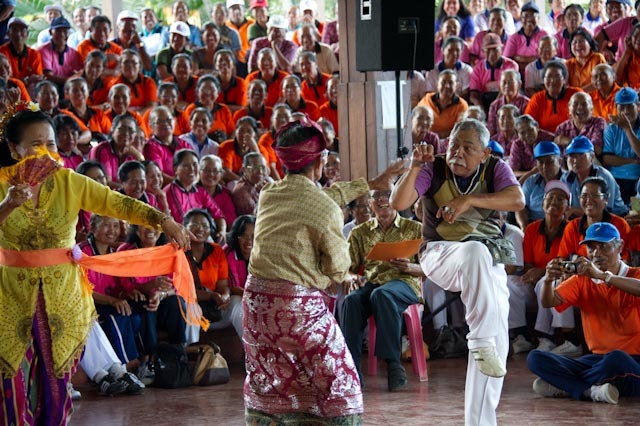 This special occasion presented YWS Bali with an opportunity to celebrate achievements in global elderly health over the last 24 years, demonstrate the impact of YWS’ work and address challages for the future of elderly people in Bali. 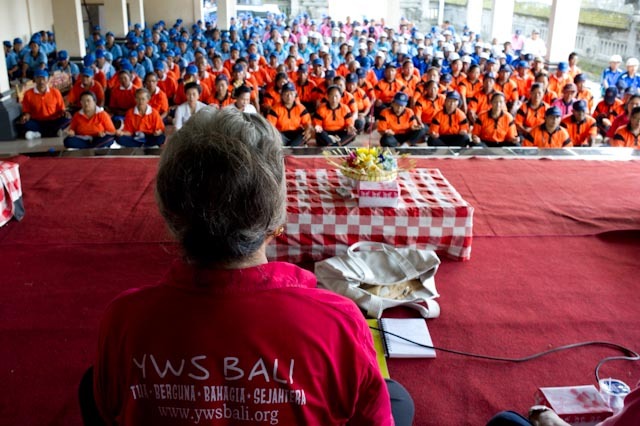 Founded in 1988, ten years prior the issuance of Elderly Welfare Law by the Government of the Republic of Indonesia, YWS Bali has become the one and only non profit organization with more than 5000 members in the country. 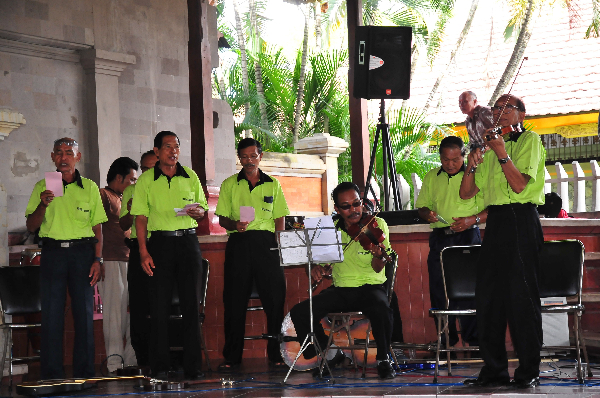 “I feel blessed to be invited by this organization and make me want to write songs for the elderly because I never thought that they still active and function normally with no help from government”, said Rai Peni as a talented young Balinese singer as he made special performance for the elderly people at Ida Bagus Marka Gallery, Kemenuh, Gianyar. 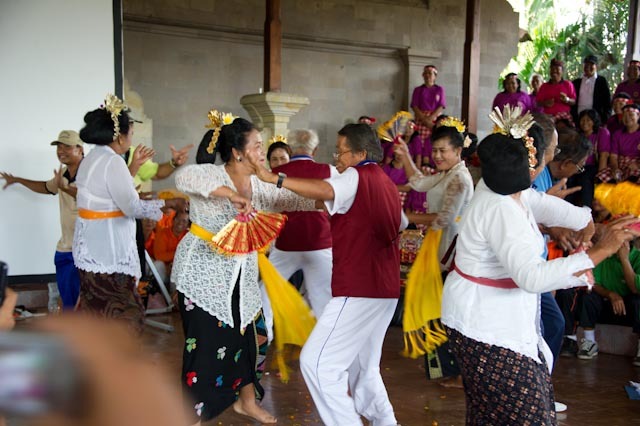 Motivated by Professor Luh Ketut Suryani as the founder and chairwoman of the organization invited more than 1ooo elderly all around Bali to participate in the special day of YWS Bali. 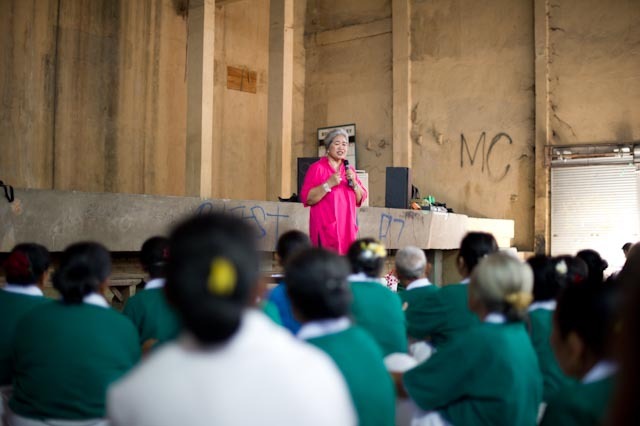 “We would like our government to re-consider they master plan to build nursing home, because it’s destroying our culture as there will be no more connection and feeling of responsible from the families, communities and the elderly themselves”, said Professor Suryani as she proposed for more culturally and functionnaly plan for the elderly people in Bali. “That is our dream that our elderly people can have a place to meet, learning, activities and transfer their knowledge and experiences to the next generation. As its graying population is increasing, facilities to accommodate the elderly remain scarce on the island of Bali.Around 10 percent of the island’s 3.88 million population are now categorized as senior citizens, aged over 60 years. 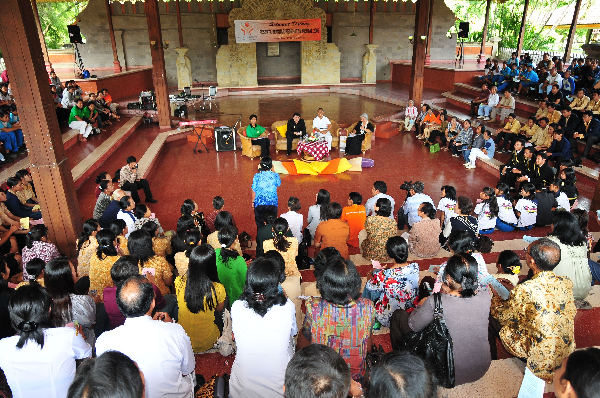 “One-fifth of the 380,000 elderly people are in poor physical and mental condition, as well as being impoverished, it is time for Bali to develop an appropriate Senior Center to accommodate the needs of the elderly here, especially those who are neglected,” said Professor Luh Ketut Suryani as the Chairwoman of Yayasan Wreda Sejahtera Bali that deals with the welfare of the elderly in commemorating the National Elderly Day 2012. 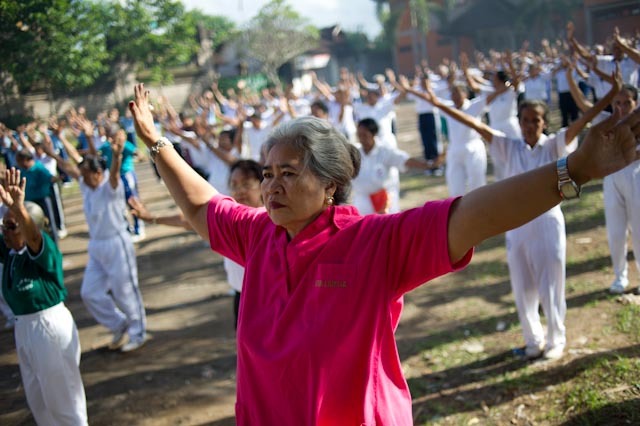 Currently, only 5,500 elderly people across Bali are registered with the foundation, she said. “The period of life when one is elderly is one of the most delicate times for any human being to go through. They are facing great changes in their physical and mental state that may lead to depression,” Suryani explained. Dr. Cokorda Jaya Lesmana, another psychiatrist, identified several acute problems faced by this group of the population. “The majority of senior citizens all over the world may face similar problems — deteriorating health, malnutrition, lack of shelter, fear, isolation, boredom, non-productivity and financial incapacity.” The doctor further explained that aging is the life-cycle stage in which the human capacity to think, act, relate and learn starts to falter and deteriorate. “Aging also causes illnesses, such as loss of memory, immobility, organ failure and poor vision, all of these critical dysfunctions could cause old people to live a lonely and miserable life,” he said. Governor Made Mangku Pastika admitted that the provincial administration had done little to improve the living conditions of senior citizens. 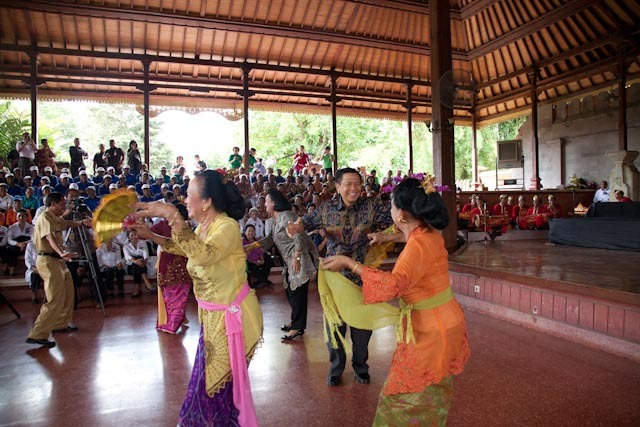 “The government is now refurbishing the nursing home in Gianyar,” he said. 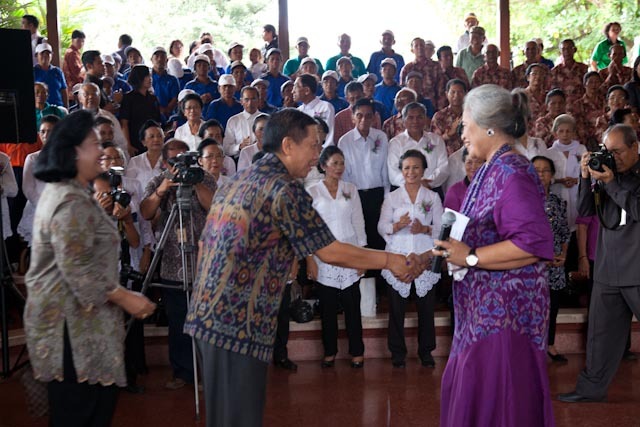 Today marks the 23rd anniversary of Wreda Sejahtera Bali Foundation. On September 8, 1988 the foundation was established, ten years before the Guidelines of State Policy and seventeen years before the issuance of the Law of Elderly Welfare by the Government of the Republic of Indonesia. 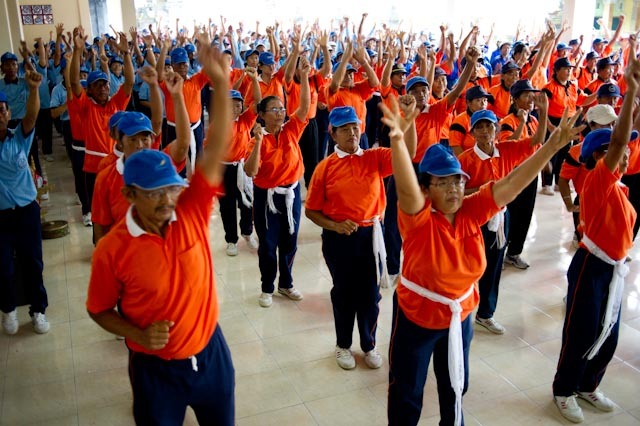 The bright and relieving idea for the elderly people in Bali was brought by Professor Luh Ketut Suryani and has became the pioneer of elderly care movement in Indonesia. 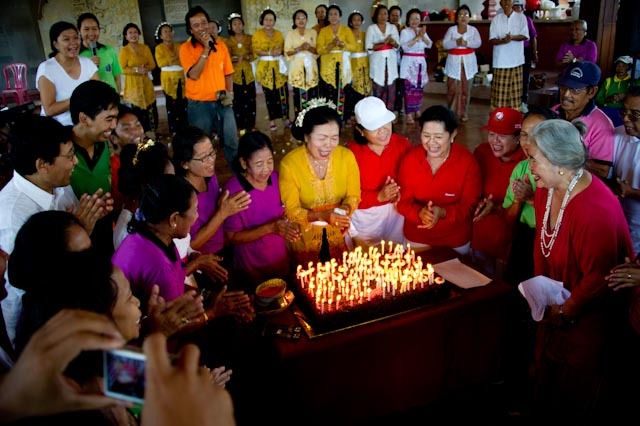 “I saw the growing number of elderly population and increasing the length of life expectancy as a result of the progress achieved in development today, then those who have the experience, expertise and wisdom need to be given the opportunity to play a role in development which our government still blind and deaf to this situation”, said Professor Luh Ketut Suryani during the celebration in Denpasar with around 2000 elderly from around Bali. “We have grown and changed a lot since our humble beginnings, and we’d like our elderly people still strong and healthy in physical, mental and spiritual”, add Professor Suryani. Indonesia was proclaimed an independent nation on 17th August, 1945. This declaration of independence came after Indonesia was colonized by the Dutch since the 17th century and by Japan in the years during the Second World War. Indonesia declared itself independent after Japan’s defeat in the war. However, even after this declaration of independence Netherlands refused to give up its colony and it was after much deliberations and discussions and UN interference in the matter that enabled final settlement. “Many elderly were veteran’s war but only a little of them found recognition from our government. We want to give a chance for a bliss of happiness life to whomever born in the month of August can celebrate their birthday in a bigger family”, said Professor Luh Ketut Suryani as the leader of Wreda Sejahtera Foundation that has more than 5000 member of elderly around Bali. Despite the misery that many elderly face through their old days, this event hopes to bring some lights for the elderly people. The Indonesian government choose May 29th as the National Day for the Elderly, also known as Hari Lanjut Usia Nasional (HLUN). 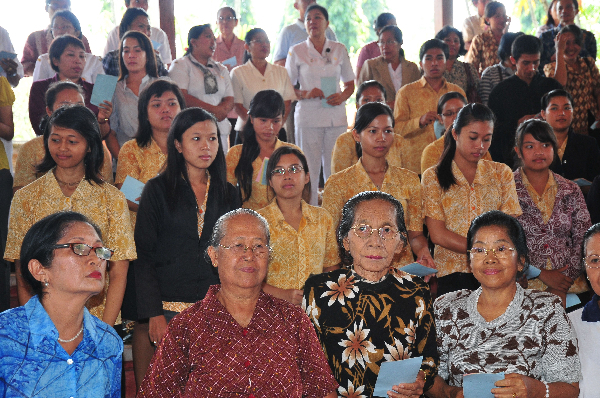 The elderly population in Indonesia continues to grow as the Central Statistics Agency (BPS) recorded in 2010 that about 23 million out of the total population of 237.6 million people were above 60 years old. But only 7000 unwell and poor elderly people were able to get government care while the rest still have to survive by their own selves. 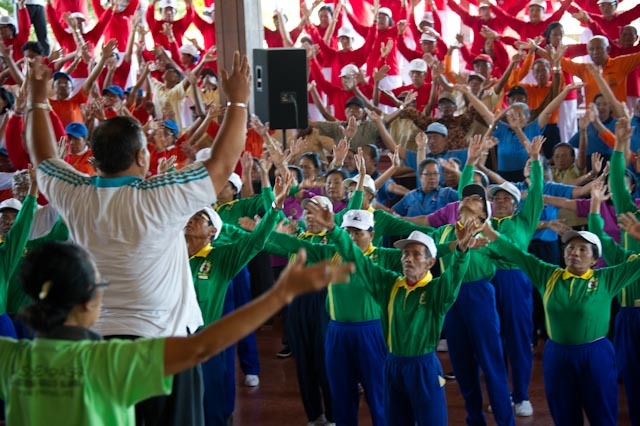 In Bali the celebration was lead by Yayasan Wreda Sejahtera Bali on Saturday 28th May, at Parliament House that invite 1600 elderly to show their creativity and productivity. “We want the government to aware that these people are still exist and need love, care and appreciation”, said Professor Luh Ketut Suryani as the leader of the foundation. Old age today is more easeful, for more people, than it has ever been, but its frustrations and disappointments have changed less than might be imagined from the holiday advertisements portraying greying sixty somethings laughing cheerfully while sipping a cocktail on a cruise liner. 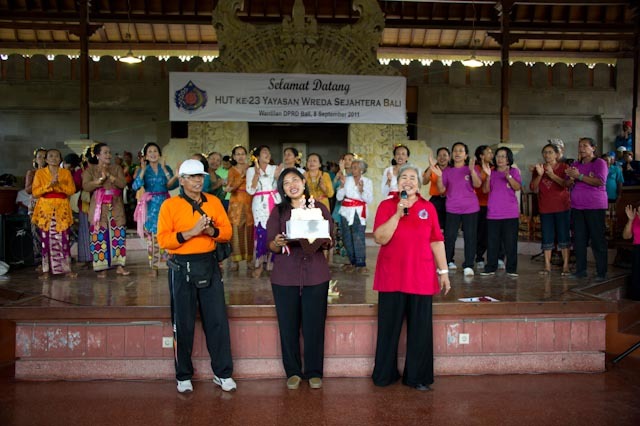 Creating a local activities for local elderly people is always a challenge for Yayasan Wreda Sejahtera Bali. 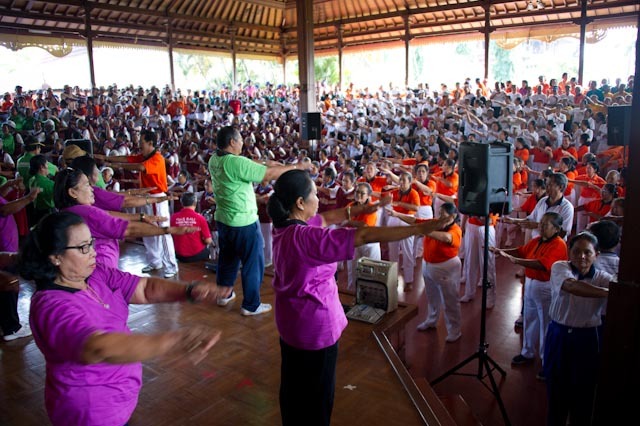 “We want our elderly people to have a long life with a healthy condition in their mind body and spirit”, said Ngakan Rai Lanus as the leader and motivator of YWS Bali branch Ubud during the healthy activities in Ubud. Everyone wants to reach old age but nobody wants to be old. Having achieved it, we lament; we strive hard to get there, fearing that we will fail, but when we succeed, we do nothing but complain. For that reason, Yayasan Wreda Sejahtera Bali created a prevention programs to make elderly people happy, productive and prosperous. 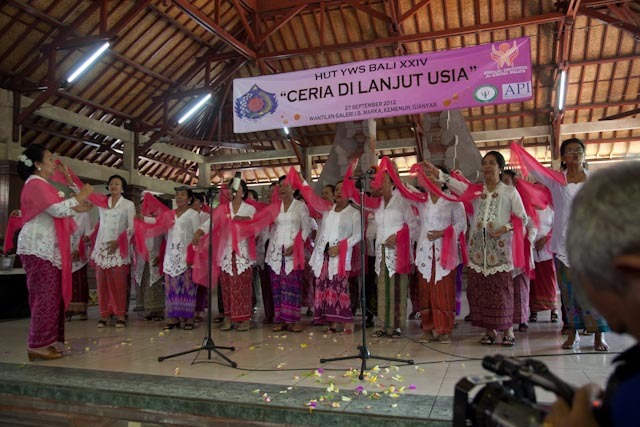 “Since 1999 our elderly in Badung regency has joined the program of YWS Bali, it was long time before government create national law for elderly care”, said Drs Gusti Ngurah Puger as the leader of YWS Bali branch Badung during their anniversary celebration. As your loved one grows older, you may find yourself shouldering the responsibility for his or her care. Should your loved one’s medical needs grow too extensive for you to handle alone; you may start to consider looking for a long term care to understand the elderly care. United Nations (2002) data predict that the percentage of Indonesians over the age of 60 will rise from 7 to 8 per cent of the population today to 13 per cent in 2025. Comparable shifts in Europe took fifty years in the case of Britain and over a century in France. Not only is the speed of change remarkable, the scale of the Indonesian situation is mind-boggling. Due to a still rapidly growing national population, in absolute terms elderly numbers will increase by 300 to 400 per cent. “With the growing number of elderly and no intention from the government to make the healthy elderly still healthy, I feel the calling to help them since 1988 and today we got help from Boehringer Ingelheim Indonesia to replicate the program that I’ve developed since 1988″, said Professor Luh Ketut Suryani when give the keynote speech during the Training on Trainee program at Puri Nusa Indah Hotel, Denpasar. The rise of the spirit of unity, unity, and nationalism and awareness to fight for the independence of Indonesia, who had never appeared during 350 years of Dutch colonization is the spirit to fight for the unity of the ancestral land of Bali as the tops of the culture of the Indonesian nation. “We want to remind people if we want Indonesia still stand we need to keep unity in diversity, and not using majority and minority as the tool to eliminate one ethnic”, said Professor Luh Ketut Suryani with national fighting spirit to keep Balinese culture alive during the seminar that also invited Dr Shri AA Ngurah Arya Wedakarna WMS represented the youth group. The issue of women is still a serious discourse to be discussed, as well as continue to experience growth, too many problems women have never gone by a period or era presence in the earth’s surface. Women’s emancipation movement in fact many women plunge into a worse condition. 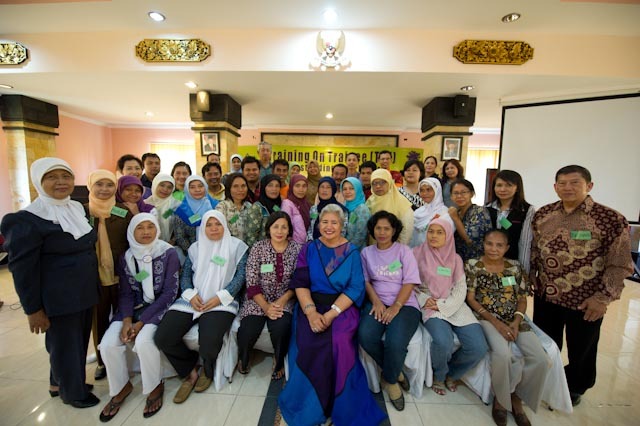 Understanding the way in implementing the Bali emancipation of women should be thought to be balanced and harmonious in life. 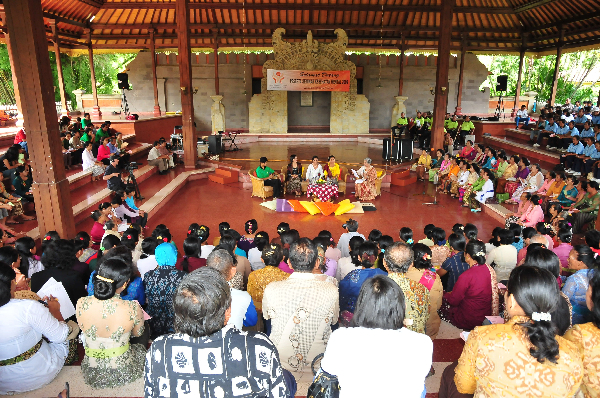 “Women have to stop fight only for heritage and material things if they want the family and culture still in balance”, said Professor Luh Ketut Suryani as she concerned on the emancipation movement in Bali got more influence by the western culture.